The school is the next best place after the home. In fact, the school is becoming increasingly important in the lives of children, because these days, more parents are away from home. The result is that there is often not too much contact between parent and child. Those who have some disposable income would entrust their children to the care of teachers in the private school system. And because of the level of supervision in the private schools, the teachers do pay more attention to the child. The child feels comfortable. That is why I became incensed when I learnt that Mae’s, a private school operating in Subryanville, caused harm to a little boy who is proud of his ancestry. And to think that the parent was paying $70,000 (app $350.US) a term for her child to take his place in this society. Next term the fee is going to be $80,000(app $400 US) a term. 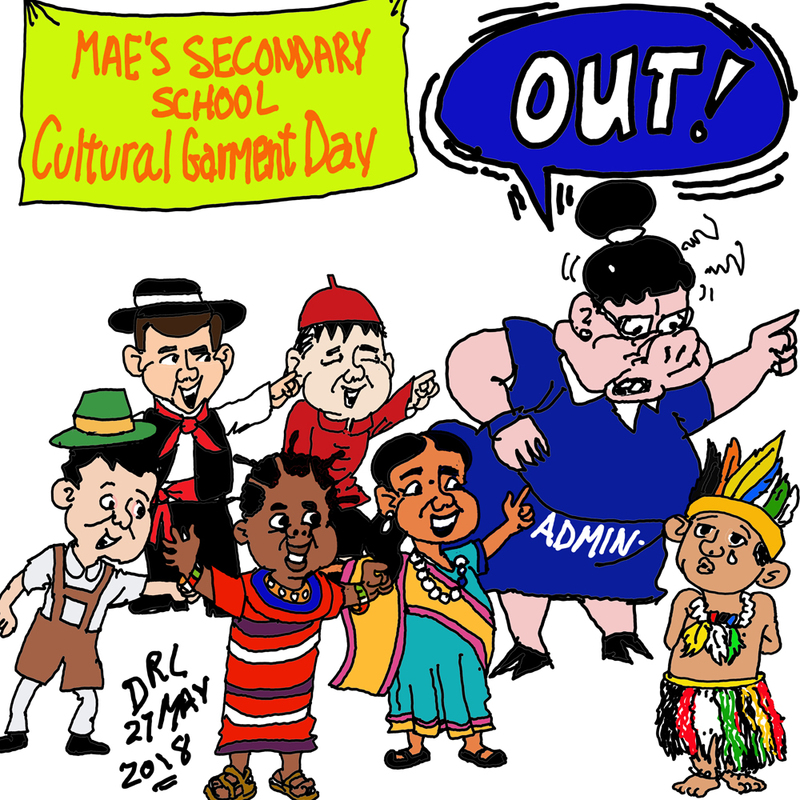 The school sent a note to parents asking that children dress in their cultural wear as part of the school’s observance of Guyana’s Independence celebration. I spoke with the boy’s mother who said that her child was over the moon when he left home. On his way to school, the people who saw him lauded him. A child was proud of his ancestry; he was proud to showcase his ethnicity. After all, he was a descendant of the first Guyanese. His world came crashing down when he entered this school. His class teacher, a Ms. Mangar, told him that his dress was inappropriate. He was wearing a grass outfit. This teacher was telling him that his cultural wear did not have a place in the school alongside those of African, Indian, Chinese and Portuguese ancestry. The boy’s mother went to the head of the school who told her that the occasion was not a Mashramani event. What nonsense! What arrogance! What stupidity! I imagined this boy crying his heart out because he was being rejected for being Amerindian. Every other mode of dress was appropriate, and was accepted, except his. Immediately some memories came flooding back. In 1972, when Guyana hosted the first Carifesta, we invited some Djukas from Suriname to perform on stage. The women apparently do not wear brassieres, but being the society Guyana is, the organisers bought a raft of brassieres for the women. They appeared on stage with their brassieres and skirts. Meghan Markle told the story of her going to school and to tick a box to determine her ethnicity. Her father is white and her mother black. There was no box for her, so she asked her teacher which box to tick. The teacher told her to tick the white box, since she looked white. Meghan opted not to do that because she would be distancing herself from her mother. At the end of the day, she approached her father who told her to draw her own box. He recognized his daughter’s predicament. Mae’s refused to recognize one of its pupils. Some of us are arrogant enough to believe that we determine the ethnic group that should be portrayed. I placed a phone call to the school on Friday and got a staff member. I identified myself to her and told her what I was calling about. I heard her whisper to someone in the background that Adam Harris was calling. Then she came back to inform me that no one was there, that school was closed for the half day. No one there wanted to address the issue; the fee had already been collected. I propose to call the school again tomorrow. I hope the headmistress could tell me about the ethnicities that are permitted to showcase their culture and their ethnicity in the school. I want her to give me a lesson on what is appropriate dress when one is asked to display one’s ethnic wear. I also remember my days at secondary school. The tie was compulsory wear, but we had a head teacher who recognized the discomfort in this hot weather. Doodnauth Hetram had just replaced Vivian Sanger-Davies. Sanger-Davies was British, while Hetram was Guyanese. He ruled that the tie should be hung no lower than the first button on the shirt. He had broken with tradition. At the national level, we try to showcase the various ethnicities in our society. When we have cultural displays, we trot out our Amerindians dresses as we believe they did way back when. We applaud them and we relish their dances. We make a lot of effort to reintegrate the Amerindians, because we recognize that they were shortchanged. They tended to move away from what we called civilization and so lied in the remote parts of the country. With time, they began to return to live among us, but they had to deal with issues like acceptance in many quarters. There was Harold Brown, a young man who was brought out from a hinterland location to attend St. John the Baptist Anglican School at Bartica. The late West Indian opening batsman, Conrad Hunte, spotted him as an off spinner and caused him to make the national team to travel to Barbados. Amerindians became teachers in our society. Soon they were in almost every aspect of national life. They were Ministers and pastors and priests. 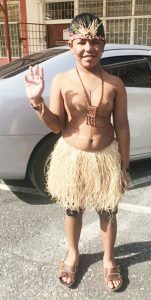 Now we have a school that is trying to tell an Amerindian boy that he is out of place once he decides to showcase his identity. I have been told that the boy now resents the aspect of his life that deals with his dress. I want the parent to encourage him to be what he is and I expect the school to offer him an apology. THE TEACHER SHOULD BE MADE TO WEAR THAT GRASS SKIRT AS PUNISHMENT. There should be legal recourse that allows the parents to sue for discrimination. The educators sure do need to improve their education, since they have made evident their ignorance about the history of the Amerindian people and their place within Guyana’s history and culture. I hope the parents demand a personal and public apology. Why the fuss now about the Amerindian boy? There was a big fuss about the jail term given to a farmer for eight grams of ganja? Why the outpouring of anger is beyond human explanation. There have been convictions for less than eight grams and there were no expressions of anger, and no one showed any emotion. Why the outburst now? The farmer had eight grams. Two days after his conviction, a young man was sent to jail for possession, not of the actual drug, but a smoking utensil. In two countries – Malaysia and the Philippines – where possession of drugs carries draconian punishment, there isn’t a policeman that would take the time to arrest someone for the mere possession of a smoking utensil. There have been more than ten young Guyanese sent to jail for possession of a smoking gadget. It makes this country, in the 21st century, an unfit land to part of modern civilization. Suddenly last week there were outpourings of denunciations over what happened to the farmer. Now there is a crescendo of biting indignations over Mae’s Schools’ mistreatment of an Amerindian boy who chose to display his native wear in school. Why the incandescent rage? It could only be laughable to those who study Guyanese society. Today, it is the little Amerindian boy. Tomorrow, it will be a Chinese or Brazilian kid. The next day, it will be another horrible absurdity that you won’t find elsewhere. And life goes on in Guyana. No one has shown concern about what happened at Mae’s before. Why now? Mae’s has a policy of peremptory expulsion for the mere possession in a child’s hand of a cell phone, not the usage of it, but the physical equipment in the child’s hand. The son of Mr. Johnson, owner of Nigel’s Supermarket, met with that fate. So was the daughter of chartered accountant, Hardat Singh. These children were traumatized in a country where there is a constitutional institution named the Rights of the Child Commission. I did several columns of this bestial tyranny at Mae’s, but sheep do not file injunctions in court, only humans do that, and humans do not live in Guyana. I have made a promise to Mae’s Schools that once I hear of that mistreatment, I will seek a court order. When my daughter was at Marian Academy, the school expelled a fourteen-year-old girl for kissing a boy. This Hadfield Street kid was subsequently destroyed. I got her into Saint Stanislaus College, but she never recovered from the trauma and didn’t complete high school. No one lifted a finger for that girl, even though I asked several parents to accompany me to see the headmistress. The sheep refused. They were all fearful. So what is new in Guyana? The little Amerindian boy at Mae’s? His event will die this weekend, never to be remembered, and this ramshackle, tenth rate banana republic will continue with its gory circus. This society has morally disintegrated. Not one soul cares about saving it. The mess is from top to bottom and has enveloped the society completely. Did Magistrate Sunil Scarce appear in front of the Judicial Service Commission for imposing a penalty that the law does not recognize? The answer is no. Did Magistrate Ann McLennan appear in front of the Judicial Service Commission for imposing a fine on an accused convicted for trafficking in humans when the law stipulates a mandatory jail term? The answer is no. But the theatre of the absurd was graphically present here. As soon as news about the magistrate going outside the law was reported, the government issued a statement condemning the decision. But that very government has retained that very magistrate. Funny, comical, laughable country! There are two incidents that have caused me to keep laughing whenever I analyze this wasteland that I was born into, and strangely in love with. I really found it hilarious when the rioting prisoners in the Camp Street jail were removed across the road to the wardens’ sports club. The convicts drank every bottle of liquor in the place. The other one involves our president. I really like this one. The constitution says a former or sitting judge or ‘any other fit and proper person.” Our president says those six other words also refer to judge-like qualities. What a country! A country and its laws are the product of its people (in this case, those who remain therein). The above examples of absurdities are a laughable reflection of those who, in their ‘infinite wisdom’, saw it fit to enact draconian laws, as well as on those who interpret and promulgate such bizarre laws. Shame on every architect responsible for this gong show. It is time for you to grow up, to get out of your caves and to realize that it is the 21st century. It is time for you charlatans to stop embarrassing the country and yourselves.